Organizations can apply for up to 40 new grants that will promote women’s economic security and leadership and prevent gender-based violence. 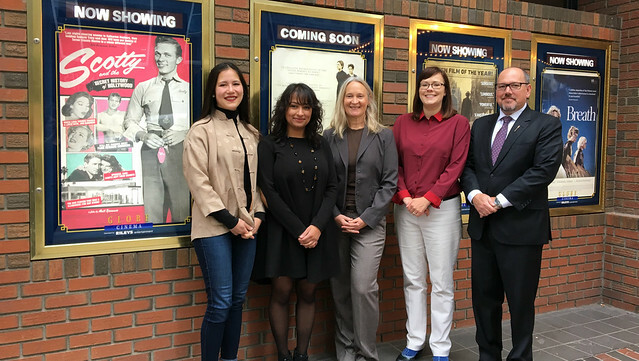 Minister Ganley (second from right) at Calgary’s Globe Cinema to announce that year three of the Status of Women Community Grant is open for proposals. The third round of Status of Women Community Grants will support non-profit partners that make life better for Alberta women. Earlier this year, the Calgary-based mentorship program Herland received $25,000 for a series of sessions supporting young filmmakers. Since 2015, Herland has provided hands-on opportunities and mentoring to young Alberta filmmakers like Gillian McKercher. After being laid off from the energy sector in 2016, McKercher co-created her own film company. She will debut her first feature film, Circle of Steel, at the Calgary International Film Festival later this month. Over the past two years, Status of Women has invested $2.4 million in 65 projects across Alberta that provide leadership, career and self-advocacy opportunities for women and girls. One million dollars of additional funding will be available in this year’s grants, which will be awarded in early 2019. Non-profit organizations can opt for one-time grants of up to $50,000 to expand successful programs to elsewhere in the province. Grants of up to $25,000 will help other non-profits organize events, conferences and training. The application deadline is Oct. 30 at 4:30 p.m.